Fr. Dan Connealy thought about how the oils he’s been using since his ordination last year were blessed while he was still a seminarian. During this year’s Chrism Mass, he joined dozens of other priests on the altar, renewing his commitment to the priesthood together with them. Fr. Dan Connealy takes a selfie while awaiting the start of his first Chrism Mass as a priest April 10. He is standing alongside Fr. Kevin Grimditch ordained in 2014, Fr. Fernando Camou ordained in 2015 and Fr. Ryan Lee ordained in 2016. “It sounded different this time in the sense that the wording is different. My ordination was kind of a blur. Here you have all the priests around you — it’s like one year, 30 years, 50 years,” Fr. Connealy said. Each year, the Monday of Holy Week finds priests, religious and laity from across the diocese packing into Ss. Simon and Jude Cathedral for a stunning liturgy known as the Chrism Mass. The sacred tradition is when the bishop blesses the oils that will be used throughout the year to celebrate the sacraments and to anoint those preparing for baptism, and priests renew their promises they made at ordination. Auxiliary Bishop Eduardo A. Nevares presided at the Chrism Mass this year as Bishop Thomas J. Olmsted was ill. In his homily, Bishop Nevares addressed his brother priests, reminding them of their solemn obligations. For Dcn. Tim Seavey, who is preparing for ordination to the priesthood in June, the Chrism Mass took on special significance. “Seeing these oils being blessed just increases the anticipation for the people of God I will serve and for the joy and excitement that I have for being ordained to serve here in the diocese,” Dcn. Seavey said. Penny Scott’s husband, Dcn. 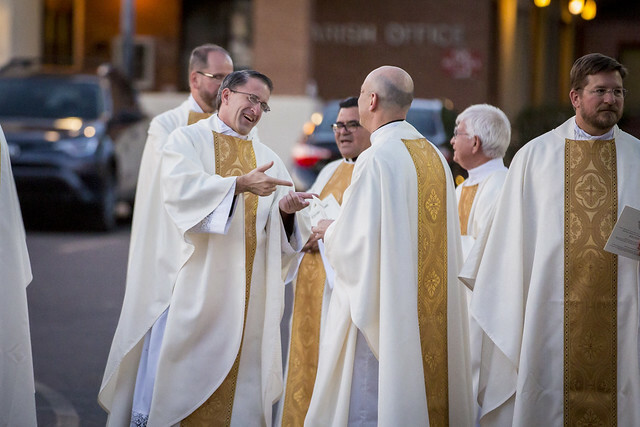 Gary Scott, was recently ordained to the permanent diaconate. She said she attends the Chrism Mass every year and finds herself thinking about how all the oils will be used. “I was just thinking about all the people who will be recipients of those oils, all the sick, the babies being baptized and people coming into the Church this year. It’s so beautiful seeing that and knowing that that’s what it will be used for,” Penny said.